If you talk to dedicated Simpsons fans, many will agree that the show peaked in the the mid-'90s, when the plots grew increasingly outlandish and fantastic. Others will pin the show's drop in quality to a point earlier in the decade, when it began to abandon its humanistic, grounded outlook for more joke-centric stories. Just about everybody will agree that since the end of the '90s, it's been in a steady overall decline in quality, with few signs of improvement. Well, there's a new fan theory that explains all of these phenomena. But it's really, really dark, and once you've heard it, you'll probably never see The Simpsons the same way again. Are you ready? It's still not too late to turn back! Since 1993, The Simpsons has not taken place in the real world, but in the deteriorating mind of a vegetative Homer Simpson. Reddit user Hardtopickname formulated his theory from a throwaway line in the classic Season Four episode "Homer The Heretic," which aired on October 8, 1992. The story ends with Homer talking to God in a dream sequence. When Homer asks God about the meaning of life, the Supreme Being tells him that he'll find out when he dies. When Homer complains that he can't wait that long, God responds, "You can't wait six months?" I propose that Homer didn't actually wake up from his coma. He is still in a vegetative state and every single Simpsons episode afterwards is in Homer's imagination. This is why the characters don't age. Homer remembers Bart, Lisa, and Maggie as 10, 8, and 1 year old, so they will always appear that way in his dreams. He is subconsciously aware of time passing, so his mind will often "update" his memories so that the year they occurred matches up with the age he thinks he is (eg. That 90's Show contradicting other flashback episodes). This is clearly Homer's imagination running wild. With no real world restrictions, Homer's mind is able to dream up scenarios of him and his family in fantasies involving him winning a Grammy, his father fighting his boss for buried WW2 treasure, his wife getting breast implants, his infant daughter saving him from drowning, etc. The massive amounts of celebrity appearances are easily explained as well. People in comas can sometime hear what people in the same room are saying. 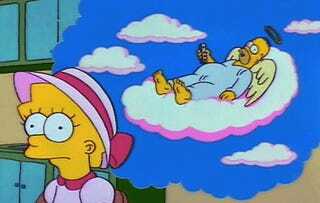 While Homer wouldn't physically react, his mind processes that information and includes it in his dreams. The theory also explains how Homer is aware of post-1993 events, as well as modern public figures and technology. His barely-functioning brain would pick up cues from his family's conversations, as well as snippets of radio and TV playing in his hospital room. On some level, he'd be aware of stuff like Lady Gaga and iPhones, and would incorporate them into his increasingly bizarre hallucinations. But Hardtopickname's theory shouldn't be seen in an entirely negative light. "Going back to Homer's conversation with God, what is the meaning of life? ... Well life can have different meaning for different people and a purpose or reason for one's existence can be as unique as their fingerprints. For Homer, his grand purpose is obvious – he is here to entertain. His dreams, his imaginative adventures, have provided billions with amusement and will continue to do so for decades. Not bad for a dumb overweight loudmouth. This also explains why Homer got stupider every year. Needless to say, Simpsons producer Al Jean has rejected the theory. So, Woo-Hoo! Or is that D'oh!? Found via the Onion AV Club.